Raquel Peel is a Speaker, Researcher, and Lecturer. 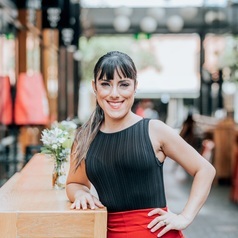 She is currently undertaking a PhD in Health and she also holds a Bachelor of Psychology with Honours from James Cook University and a Bachelor of Arts with a double major in Art History and Music from Sydney University. Raquel has conducted research in suicide, bullying, stigma, religiosity, rural medicine, and romantic relationships. Her honours research on suicide was awarded best student paper at an international conference in Singapore in 2017. Also, her research on romantic relationships has received a lot of media attention including TV and radio interviews, and online and newspaper articles. Alsi, October 2018 Raquel gave a TEDx Talk on self-sabotage in romantic relationships. As a current postgraduate student, she is also passionate about raising awareness of mental health in higher education and has developed a Mental Health Program for HDR Candidates. Further, her work as a lecturer and tutor has been recognised with a prestigious Inclusive Practice Teaching Award. In past roles, Raquel has worked as a detention youth worker for Cleveland Youth Detention Centre, as a crisis counsellor for Lifeline, and as a music manager. Raquel is passionate about people and the expression of life. She is originally from Brazil and has travelled and lived in many places around the world. International Journal of Innovation, Creativity and Change, Mental health diagnoses and relationship breakdown: Which is the chicken and which the egg?